Remark : This is a window advertisement for Cow & Gate Milk Food. It claims to be the food for royal babies. 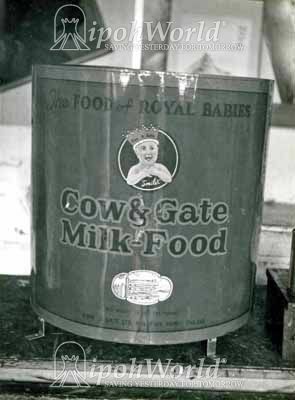 The company was founded by two brothers in 1711 selling milk and cream from a small store in Guildford, Surrey, UK. They discovered a solution to the problem of left over skimmed milk when they came across a drying machine that could turned it into milk powder. Their first advertisement for this new product was issued in 1908. The company went from success to success and in 1959 joined United Dairies to form the Unigate Company. If anyone has more information, we would be pleased to receive.